Modern European Stu dies, Liberal Arts Mast er’s Program, Columbia University, New York, USA. Received October 15th, 2011; revised November 14th, 2011; accepted November 20th, 2011.
gages with a number of historical currents, thinkers, and concepts, which shape historical i nqu iry. ized’ history—and if so, how. his own vision of history onto his admired colleague. posed to its deceitfulness when relied upon excessively. 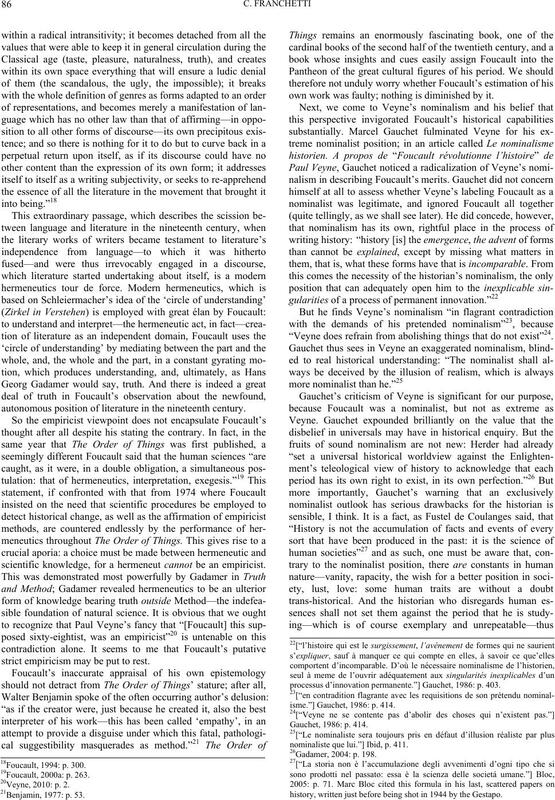 Veyne’s arguments for Foucault’s revolutionizing history. 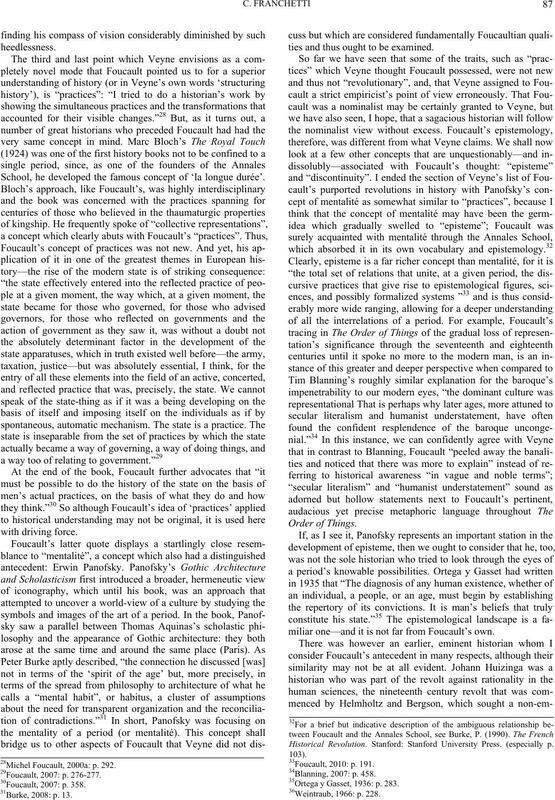 14Foucault, 1 994: p. 219.
matic wea kening of Hegel’s influence a fter the revolutions of 1848.
to Eighteenth and Twentieth Century Linguistics. London University. autonomous position of literature in the nineteenth century. scientific knowledge, for a hermeneut cannot be an empiricist. strict empiricism may be put to rest. own work was faulty; nothing is diminished by it. “Veyne does refrain from abolishing things that do not exist”24. processus d’innovation permanente.”] Gauchet, 1986: p. 403.
isme.”] Gauchet, 1986: p. 414.
nominaliste que lui.”] Ibid, p. 411.
history, written just before being sh ot in 1944 by the Ge stapo. School, he developed the famous concept of ‘la longue durée’. ties and thus ought to be examined. 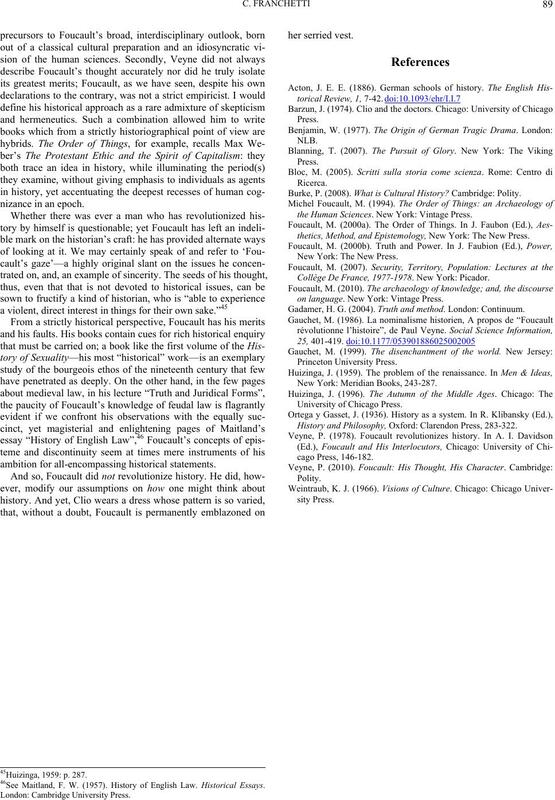 miliar one—and it is not far from Foucault’s own. istorical Revolution. Stanford: Stanford University Press. 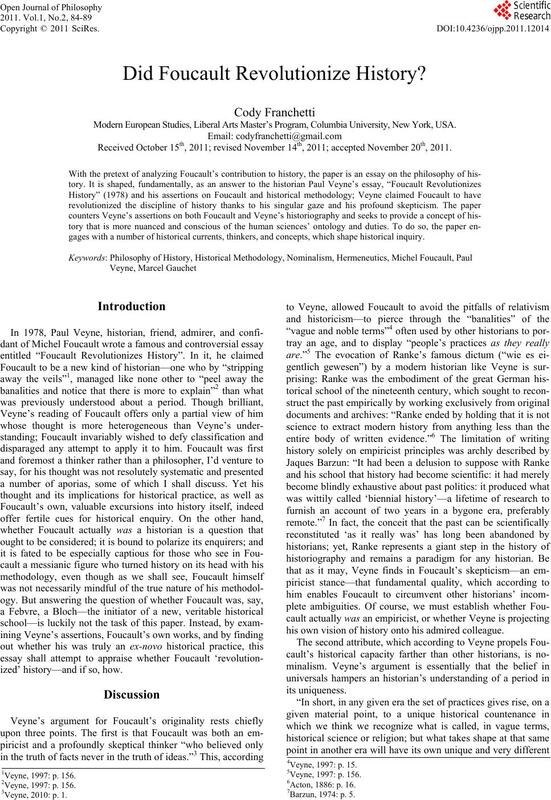 (especially p.
35Ortega y Gasset, 1936: p. 283. 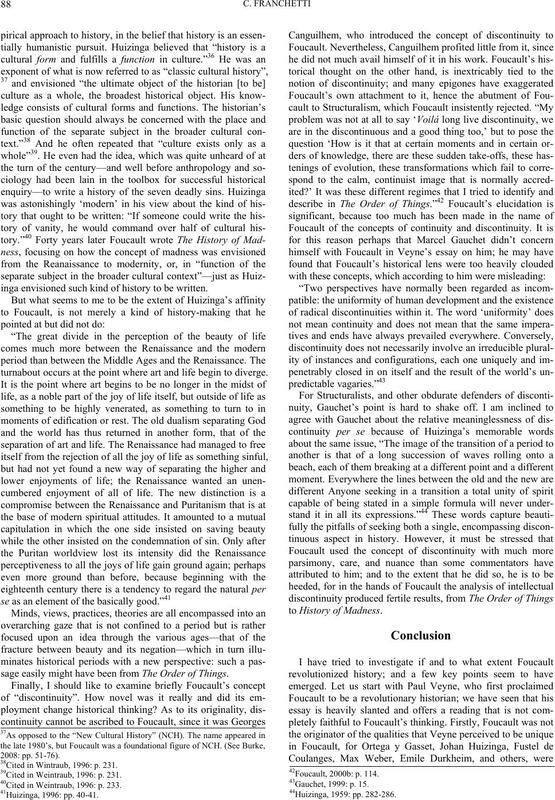 28Michel Foucault, 2000a: p. 292. 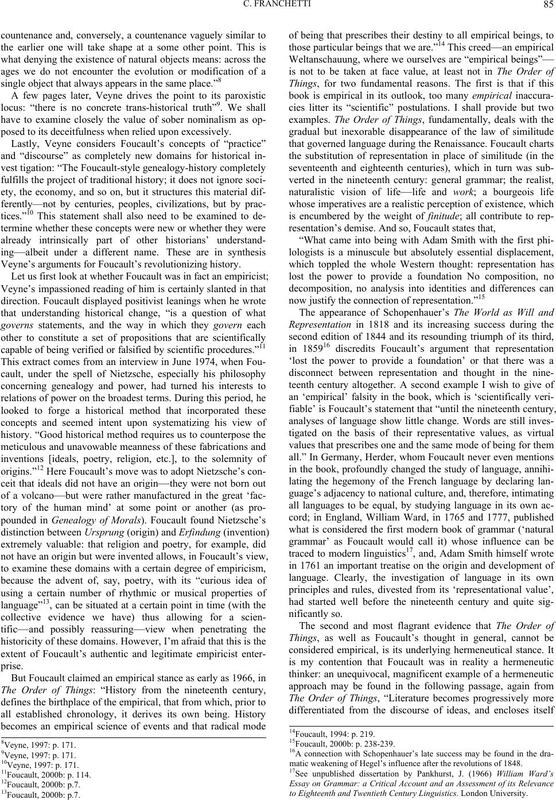 29Foucault, 2 007: p. 276-277.
inga envisioned such kind of history to be written. turnabout occurs at the point where art and life begin to diverge. sage easily might have been from The Order of Things. 38Cited in Wint raub, 1996: p. 231. 39Cited in Weintraub, 1996: p. 231. 40Cited in Weintraub, 1996: p. 233. 41Huizinga, 1 996: pp. 40-41.
ambition for all-encompassing historical statements. Burke, P. (2008). What is Cultural History? Cambridge: Polity. the Human Sciences. New York: Vintage Press. thetics, Method, and Epistemology, New York: The New Press. Collège De France, 1977-1978. New York: Picador. on language. New York: Vintage Press. Gadamer, H. G. (2004). Truth and method. London : Continuum. New York: Meridian Books, 243-287. History and Philosophy, Oxford: Clarendon Press, 283-322. 46See Maitland, F. W. (1957). History of English Law. Historical Essays.